But fear not! This blog post is a simple explanation of how to create your blog using Squarespace. If you’re not sure what Squarespace even is, it’s basically a platform where you can easily build a website. You just sign up, choose a template, do a bit of simple DIY design and start blogging. If you’ve been to this blog before, then you’ll probably know that I’m a diehard Squarespace fan. I have so many blog posts about Squarespace (tutorials on how to do just about everything) that you could build your blog or website using resources from this blog alone — I know many people who have! 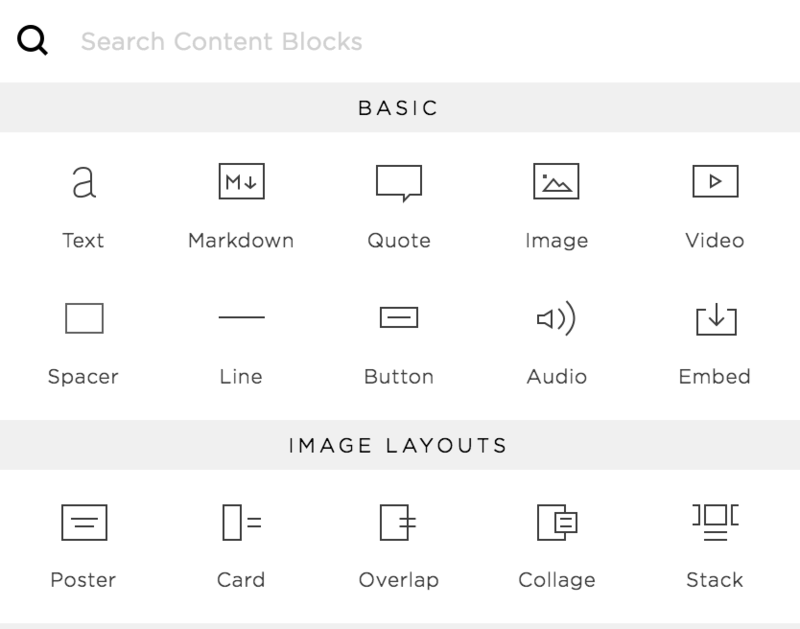 The Squarespace blogging interface is by far the most simple blogging option I’ve ever used (and yes, I’ve tried many!). 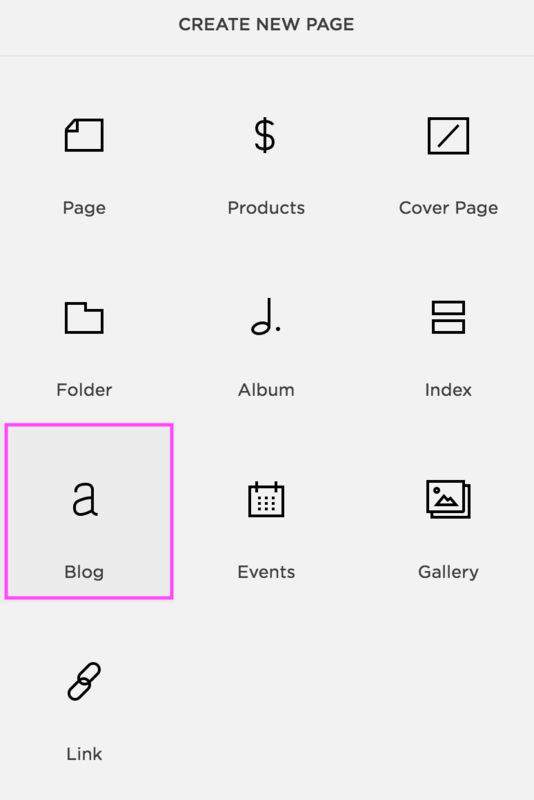 You can add a blog posts to ANY Squarespace website, no matter which template you are using. And the blogging interface is the same no matter which template you’re using also. One thing that is important to note is, depending on which template you choose, your blog may look different. The process behind the scenes to create and post blogs is the same, but the actual style, look and layout of your blog will vary by template, so keep this in mind when choosing your template. To add a blog to your new Squarespace site, it’s really simple. Just head over to Pages in your sidebar and click + to add a new page. From there, you’ll want to select the Blog link. Click on the new blog page in your pages panel to open up the blog interface. You’ll see something like this. This is where all of your blogging will happen! First, click on the little Cog to check all of your blog settings. Most of these settings you can just leave as is. But, it’s good to know that there are a lot of settings in here, and further down the track you might need to adjust something. When people land on your blog, do you want them to be able to see the full post or just an excerpt of the post? Most people choose except here, so the visitor can land on the main blog page and choose which post they want to read, rather than seeing the full contents of the most recent post. You can toggle this on and off later if you’re not sure what the difference is. If you’ve adjusted these settings make sure to hit save when you’re done! I love blogging with Squarespace because it’s really intuitive. Most of the stuff in this pop-up is pretty self-explanatory. Eg “Enter Post Title…” well, go ahead and enter your post title there! You can see at the bottom there are some more options. You can add tags or categories. These are good for organizing your posts. I recommend at least adding categories so you can organize your blog. Tags are good for some situations but definitely not necessary. This is entirely up to you! You can change these for each individual post, and you can also turn them on or off site-wide in your settings. If you click on draft you will see a whole list of options pop up. Choose here if you want to publish now (this makes the post live on your blog), if you want to schedule (to automatically publish at a set time) or if you want to mark it for review (this is good if you have staff/authors). Just leaving it as a draft will leave it hidden from your blog. This is important and you’ll want to add a Thumbnail Image for each post. These show on your blog page and wherever else you display your blog around your site. I recommend writing your own Post Url. It’s good to keep these down to a few words. For example you can see the different in this post between the Blog Title and the Post URL. The Post URL is a more simplified version. You don’t have to change this, but it is good for SEO. You should always write a blog excerpt. This can be used alongside your thumbnail image for a breif overview of what the post is about. But even if you don’t display your excerpt anywhere on your site (I don’t!) you should still write them because they are good for SEO and they show up under your posts in search engines like Google. Those are all of the main things I look at when adding a blog post. I don’t generally use Location or Social (in the top panel). If you do have a physical address for your store you can add it there if you want to. And I do recommend sharing your posts on Social so you can use this option if you want, but I personally share mine manually, not through this automatic option. In the section above we briefly talked about how you can add any blocks to any post, which is great! I find it much easier to design my posts while I can actually see what they’re going to look like, rather than in that small pop-up box we were looking at before. So, I add all of my settings into the new post pop-up box we talked about above, and then I hit save (not save and publish, it’s still a draft). After you click save the pop-up will close and the blog post will show up in your list of posts on the left. Now you can click on the post name and it will open a preview of the post on your page. Note: this can be a bit glitchy sometimes, if it’s not doing anything when you click on the post, just refresh and click on it, now it should work! I much prefer to add my blog posts like this so I can see what it will actually look like when I publish it! Go ahead and add any blocks you want, and what you’re looking at now will look exactly like that when it’s published! So now you know how to add and edit and individual post, you’ll want to edit your blog page. The way that this blog page looks depends a lot on the template you chose in the beginning, so it’s a little bit hard to show you how to do this exactly, since I’m not sure which template you’re using. To view you blog page, you need to navigate out of your blog and back to pages in the sidebar, the click on blog page again. It will automatically take you to your blog landing page, rather than a post. You’ll need to have some live posts before you can really start designing anything. While you’re looking at the blog post page, hover your mouse around the top of the page and you will probably see intro (again, this depends on your template). Here you can add any text you want, eg “Welcome to the Blog!” and maybe a list of blog categories. One way to edit your blog page (and your blog posts) in every template is through the Style Editor. Navigate out of blog and out of pages and head to Design and into the Style Editor. Scroll down until you see settings for BLOG and start playing around with the settings there. And that’s about it! Crazy, huh? How easy is blogging with Squarespace? Once you get these basics down there are a lot of ways to progress and grow your blog on Squarespace. If you’re looking for more info, check out all of my other Squarespace tutorial posts or you can head to squarespace.com where they have guides on everything to do with Squarespace. Below is our line of Premium Squarespace Templates for sale. If you’re new to Squarespace or just want to set up a beautiful blog, I highly recommend these! They come with step by step video instructions on how to set the whole site up. Check out Blogette or Transient if you’re a blogger, as these two Squarespace Templates were created especially for bloggers. Though, all of the templates have blog features, so you can easily add a blog to any of them!